Does Your Metabolism Slow Down When You Are Sick? Your body's metabolism involves all of the chemical and biological processes necessary for the conversion of food into energy and the use of the energy. This means that metabolism includes digestion, excretion, blood circulation, temperature regulation, breathing, hormone production, muscle function, cell repair and new cell growth. When you become sick, your metabolism does not slow down; it actually speeds up to fight off the illness. Your body temperature fluctuates slightly depending on time of day and activity, but doctors consider 98.6 degrees Fahrenheit to be normal body temperature. Your body regulates temperature by increasing or decreasing the production of sweat, sending signals to your brain to seek a different environment, and by moving blood away from or closer to the skin. When you become sick, due to invasion by a virus or bacterium, the cells of your immune system produce antibodies to fight off the foreign invader. This increased activity in the body causes body temperature to increase, causing a fever, defined as any temperature of 100.4 degrees Fahrenheit or higher. An article in the June 2001 issue of the journal "Pediatrics" reported fever as the most common reason parents seek medical attention. 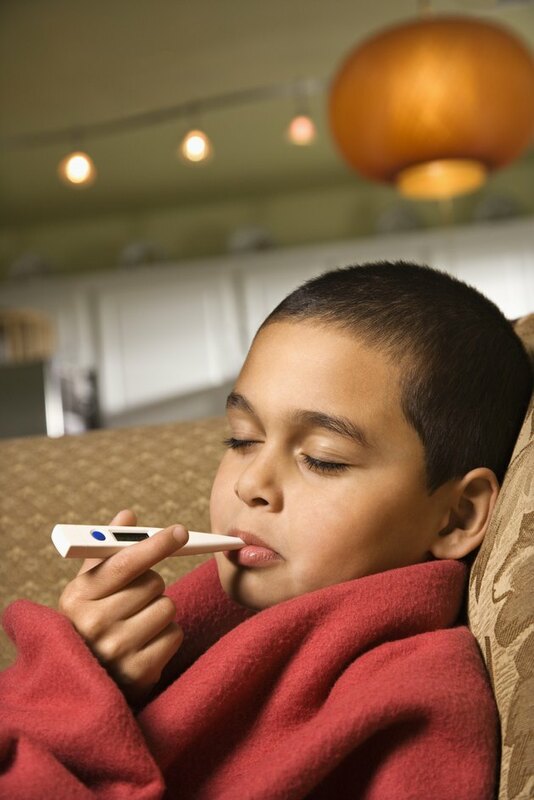 Fever occurs as a natural defense mechanism and in most cases serves an important purpose. Invasion by a foreign substance causes your metabolism to increase and raises your body temperature to create an environment inhospitable to the foreign invader. Bacteria and viruses thrive, grow and multiply at normal body temperatures, but they cannot survive at higher temperatures. Carbohydrates consist of sugar molecules bound together. Your body breaks down carbohydrates into individual sugar molecules and converts them into glucose, also known as blood sugar. Glucose serves as the main source of energy for your cells. After you eat, the level of glucose in your blood increases, which stimulates the pancreas to produce the hormone insulin. Insulin binds to special receptors in cells, which allows the cell to absorb and utilize the glucose. Under conditions of stress, such as when you are sick, your body increases the rate of glucose production, which contributes to an increased metabolism. Although illness caused by viral or bacterial infections can cause your metabolism to increase, a slow metabolism may be a sign of disease. Symptoms of a slow metabolism include fatigue, constipation, sensitivity to cold, muscle cramps, irritability and weight gain. If you experience these symptoms with an unknown cause, seek advice from your doctor. A slow metabolism can occur as a result of thyroid conditions like hypothyroidism, diabetes and hormone imbalance.